The NRL’s acquisition of the Immortals concept, and the recent announcement that players from the pre-World War II era would be considered for the next round of inductions, has opened the door for the greats of rugby league’s early decades to be properly recognised. Two new Immortals will be named later this year – taking the total to 10 – and there’s a high chance one of the inductees will come from the 1908-45 period. We’ve named the top 10 contenders from the code’s formative years that are likely to come into consideration when the panel gets together. The calibre of players from that era is emphasised by the fact there was no room for the likes of champion halfbacks Chris McKivat and Arthur ‘Pony’ Halloway, NSW Country luminary Eric Weissel, legendary forwards ‘Sandy’ Pearce, ‘Joe’ Pearce, Ray Stehr and George Treweek, South Sydney fullback Howard Hallett and Balmain utility-back Charles ‘Chook’ Fraser in this list. 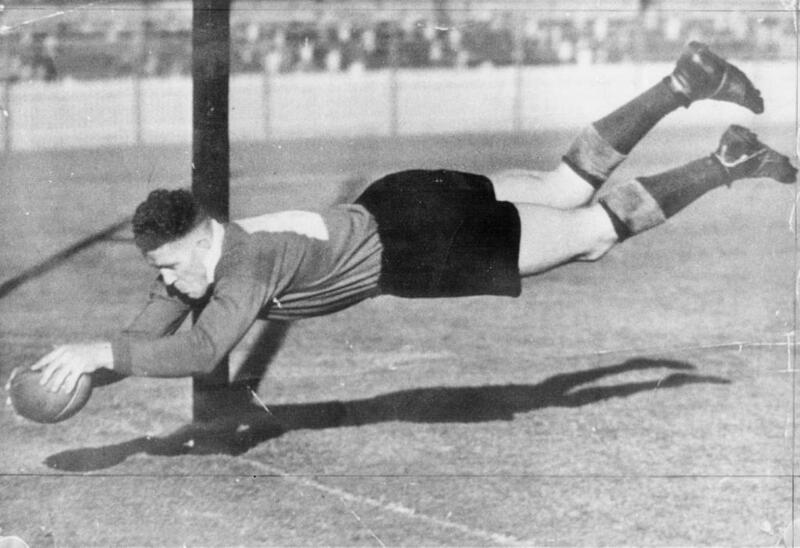 Named as a second-rower in the NSW Country and Newcastle district Teams of the Century – and a controversial omission from the NSW Team of the Century – Herb Narvo was a gifted all-round sportsman, winning the Australian heavyweight boxing championship in 1945. He was well-established as a rugby league great by that stage, first representing Australia on the 1937-38 Kangaroo Tour after leaving Newcastle for Newtown. The tough, intimidating and skilful, Narvo returned to North Newcastle the following season and was a regular in the NSW state side, but the wartime embargo on international football dictated that he never played for Australia again. Narvo embarked on another stint at Newtown in 1943, helping the club to its last premiership that year, while he captain-coached St George to a grand final loss in 1946. A much-loved figure wherever he went, Narvo captain-coached in the bush before enjoying a brief stint back at Newtown in 1949. Jimmy Craig can lay claim to being the greatest utility player in Australian rugby league history. Craig played seven Tests for Australia against England from 1921-28, including appearances at centre, halfback and fullback, while he was also an accomplished winger and lock. A key member of the Balmain side that won premierships in 1915-17 and 1919-20, Craig spent a season at University in 1922 before moving to Ipswich and captaining Queensland to a long-awaited series win over NSW. He was elevated to the Australian captaincy for the 1924 Ashes series. Craig ended his career in spectacular style, returning to Sydney and captain-coaching Wests to their maiden premiership in 1930. Added to the ARL Hall of Fame in 2005 and named as a reserve in the Queensland Team of the Century in 2008, perhaps the greatest accolade afforded to the influential ‘Mr Versatile’ was none other than Dally Messenger declaring him the greatest player he ever saw. Tom Gorman’s legacy is built around being the first Queenslander to captain a Kangaroo Tour but he also rates as one of the greatest centres of all time. After first representing his state in 1921 and starring for the all-conquering Toowoomba side, Gorman made his Test debut during the 1924 home Ashes series and was declared Australia’s best player by the victorious Englishmen. Gorman played 10 consecutive Tests, while his burgeoning status in the game was recognised when he skippered Australia during the 1928 Ashes series, and then on the 1929-30 Kangaroo Tour after joining Brisbane Brothers. A brilliant attacker, ‘Gentleman Tom’ was named alongside Mal Meninga in the centres in Queensland’s Team of the Century in 2008, ousting the likes of Gene Miles and Steve Renouf. He came in at No.21 in Rugby League Week’s ‘Top 100’ in 1992 and received an ARL Hall of Fame nod in 2007. Wally Prigg spent his entire career in Newcastle, but his status as the game’s finest lock during the 1930s was undisputed. He played a then-record 19 Tests from 1929-38 and toured three times with the Kangaroos, while he still holds the record for most interstate appearances for NSW (34). A terrific defender, quick and a clever ball-player, Prigg skippered the 1937-38 Kangaroos and led Australia in seven Tests. Prigg was voted No.18 in Rugby League Week’s ‘Top 100’ of all time in 1992 – the fourth-ranked forward behind Johnny Raper, Arthur Beetson and Frank Burge. He was a reserve in the NSW Team of the Century and at lock in the NSW Country and Newcastle district Teams of the Century in 2008. Widely regarded as the greatest of all pre-war halfbacks – ahead of pioneering icons Chris McKivat and ‘Pony’ Halloway – Thompson’s influence on rugby league in Queensland and Sydney was immense. 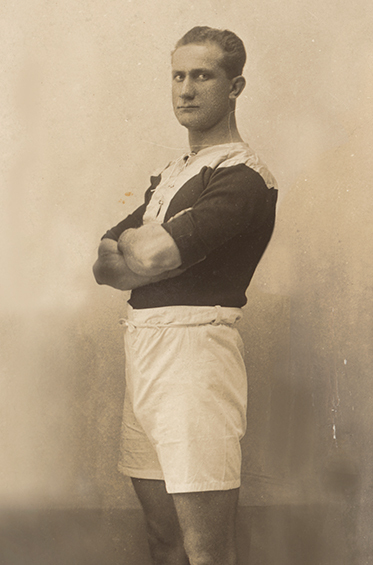 Thompson debuted for Queensland from Ipswich in 1915 and played the following season with North Sydney, before serving in World War I where he was shot in the lung. He debuted for Australia after resuming his career in 1919 then rejoined Norths the following season, steering the club to premierships in 1921-22 as the linchpin of a phenomenally talented backline. A standout on the 1921-22 Kangaroo Tour, Thompson’s Sydney career ended in 1923 when he was controversially banned on the charge of kicking (which he vehemently denied). But he subsequently left for Toowoomba and led the famous ‘Galloping Clydesdales’ combination to victory over Ipswich, Brisbane, South Sydney, NSW, New Zealand and England, while also represented Queensland and Australia for the final time. One of the great rugby league thinkers, Thompson enjoyed a decorated coaching career and was inducted to the ARL Hall of Fame in 2005. He was voted as the 10th-greatest Australian player of all time in a Rugby League Week competition in 1992 and was named as a reserve in Queensland’s Team of the Century in 2008. When a panel convened in 1992 to choose the top 100 Australian players of all time for Rugby League Week, Vic Hey came in at No.7 – behind only Dally Messenger of the code’s pre-war stars. Unanimously regarded as the greatest-ever five-eighth until Bob Fulton and Wally Lewis came along, Hey defined the position for almost half a century. Hey made his first grade debut for Western Suburbs in 1933 and was chosen as a late injury replacement in the Kangaroo Tour squad later that year, ultimately wearing the No.6 jumper in all three Tests. He spearheaded Wests’ drive to just their second premiership in 1934 – scoring 11 tries – before starring in the 1936 Ashes series following a move to Toowoomba. A dynamo in attack and defence, Hey became a Leeds legend during a decade in England but finished his career as captain-coach of fledgling Parramatta in 1949. The ‘Wonder Winger’s’ omission from the Australian Team of the Century (for Ken Irvine and Brian Bevan) and NSW Team of the Century (for Irvine and Dally Messenger) in 2008 was one of the most contentious of all. A superstar from the moment he scored a dazzling try on debut for South Sydney in 1912, Horder amassed 152 tries in just 136 games for Souths and Norths over a sparkling 13-season career, winning two premierships with each club (1914 and ’18 with Souths, 1921-22 with Norths). Also a prolific goalkicker, scoring 758 points in first grade, Horder set new standards for wing excellence and rugby league entertainment. He scored 11 tries in 13 Tests, as well as 35 tries in just 25 games on the 1921-22 Kangaroo Tour, and routinely terrorised Queensland at interstate level – most notably scoring five tries in back-to-back games for NSW in the 1915 series. After a farewell season back at Souths in 1924 Horder finished his career in Queensland. He was added to the Hall of Fame in 2004. Glebe icon Frank Burge was the most devastating forward of the pre-WWII era – and perhaps in the game’s history. His record of 146 tries in just 164 games tells a major part of the story: Burge scored an unprecedented 20 tries in 1915, bettered his record in 1916 (22 tries) and 1918 (24), and crossed for a still-unmatched eight tries against University in 1920 amongst a then-record haul of 32 points. Burge also scored six tries against Norths in 1916 and it wasn’t until the incomparable Easts side of the mid-1930s came around that any other player managed more than five tries in a match. The second-youngest of four ex-rugby union brothers that all went on to play league for Glebe, Burge debuted at 16 in 1911 and was in the NSW side a year later. He was primarily a back-rower but was also used frequently at prop, including throughout his first Test series against the touring England side in 1914. Burge set standards for fitness and professionalism that players decades later had not caught up to. An extraordinary 33 tries in 23 games on the 1921-22 Kangaroo Tour concluded his international career, while after leaving Glebe he captain-coached previously struggling St George to their first finals series in 1927, after which he retired from playing. A 2004 ARL Hall of Fame inductee, Burge was named on the bench in the Australian Team of the Century and at prop in the NSW Team of the Century. The hot tip to be awarded one of the two available Immortal slots later this year, Herbert Henry ‘Dally’ Messenger was monumentally important to rugby league’s pioneering success. He was Australian rugby union’s biggest superstar and his decision to sign with the ‘rebel’ code opened the floodgates. Primarily a centre, Messenger was a true footballing genius – a virtuoso in almost every aspect of the game. His attacking wizardry and goalkicking exploits immediately passed into rugby league legend. After touring with the famed New Zealand ‘All Golds’ in 1907-08, Messenger turned out for Eastern Suburbs in the inaugural NSWRL premiership and top-scored on the maiden Kangaroo Tour, though his form was down on its mesmerising, stratospheric best. Messenger pointscoring feats at interstate level were remarkable, racking up 75 points (nine tries, 24 goals) for NSW in the 1911 series against Queensland, including a record 32 points in the opening clash. He played the last of his seven Tests against the touring England side in 1910 but he continued to dazzle at club level, leading Easts to three straight premierships before hanging up the boots in 1913. Messenger’s nickname, ‘The Master’, summed up his influence on rugby league’s formative period, while his legacy lives on courtesy of the Dally M Medal, struck in his honour in 1980. Messenger was inducted to the ARL Hall of Fame in 2003, its second year, and was named as a reserve in the Australian Team of the Century and on the wing in the NSW Team of the Century in 2008. Dave Brown’s moniker – ‘The Bradman of League’ – sums up his phenomenal impact on the game during the 1930s. Brown set pointscoring records with Eastern Suburbs and Australian that are destined to stand forever, while he was a respected captain and a brilliant, selfless centre. He debuted for Easts as a 17-year-old in 1930 and was still a teenager when he captained NSW for the first time in 1932. Brown tallied a record 285 points on the 1933-34 Kangaroo Tour and became Australia’s youngest Test captain on a tour of New Zealand in 1935. At first grade level in 1935, Brown truly cemented his legend. He scored a then-record 244 points and a still-unmatched 38 tries in just 16 games, including an unsurpassed 45 points in a match and another haul of 38 points, which remains equal-second in premiership history, both against Canterbury. Twice he scored six tries in a match. Brown was the jewel in a talent-laden Tricolours line-up, leading the club to premierships in 1935-36 (going through the later season unbeaten) and captaining Australia against England in 1936. He spent the next three years with English club Leeds before returning to captain-coach Easts to another title in 1940. An ARL Hall of Fame inductee in 2003, Brown’s name was a glaring omission from the Australian Team of the Century five years later but he was named as a reserve in the NSW Team of the Century.